Sound familiar? 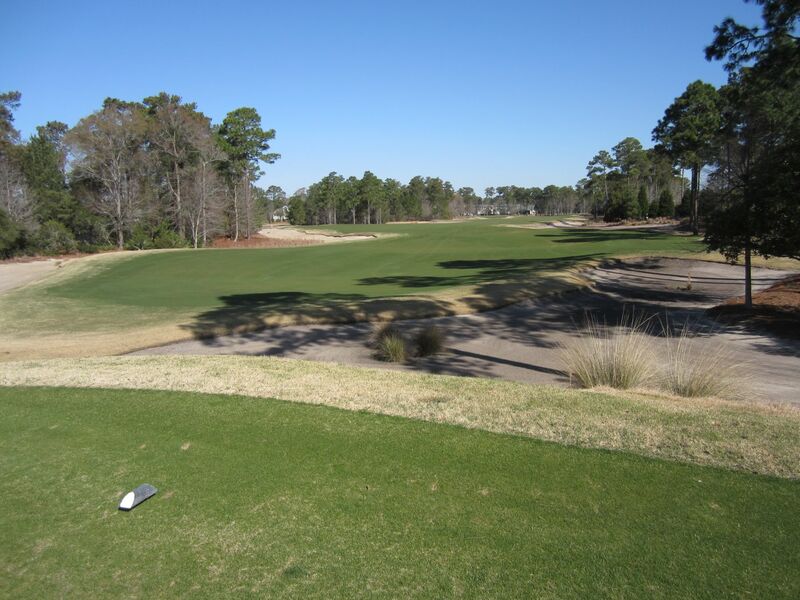 If you were wondering where this beautiful hole featured by Myrtle Beach Golf Holiday’s commercial can be found, the answer is at True Blue. While the third is an awesome hole, it is just one of many at a course that rolls out one signature hole after another. Much like one of my favorite courses here in Wisconsin, Wild Rock, True Blue has a “big” feeling – big sand traps and fairway bunkers, big water features, and huge greens. I had the pleasure of playing this otherworldly golf track this past March, during our inaugural yearly golf trip to South Carolina. We stayed in a condo at True Blue, which is found in Pawley’s Island. While the condos here left much to be desired, the course did not. 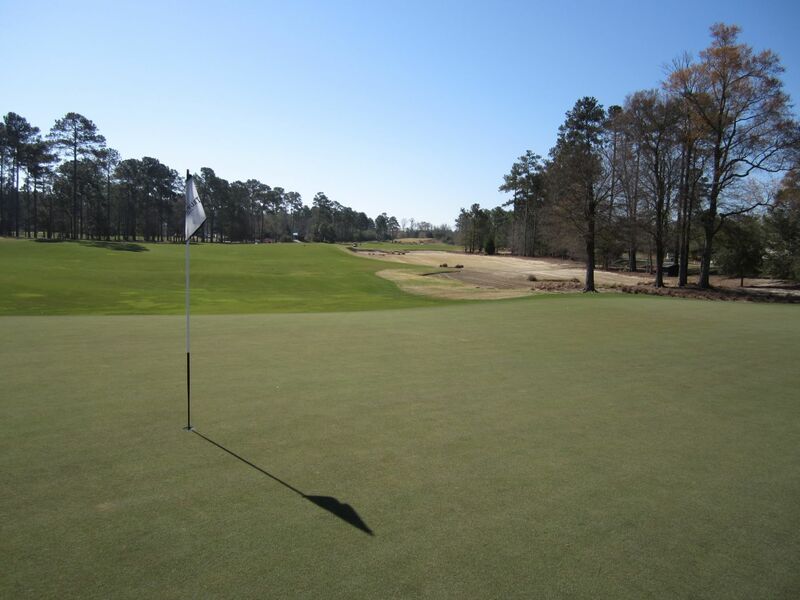 From the very first hole – the number one handicapped hole on the course – True Blue is a tremendous challenge of golf skill. 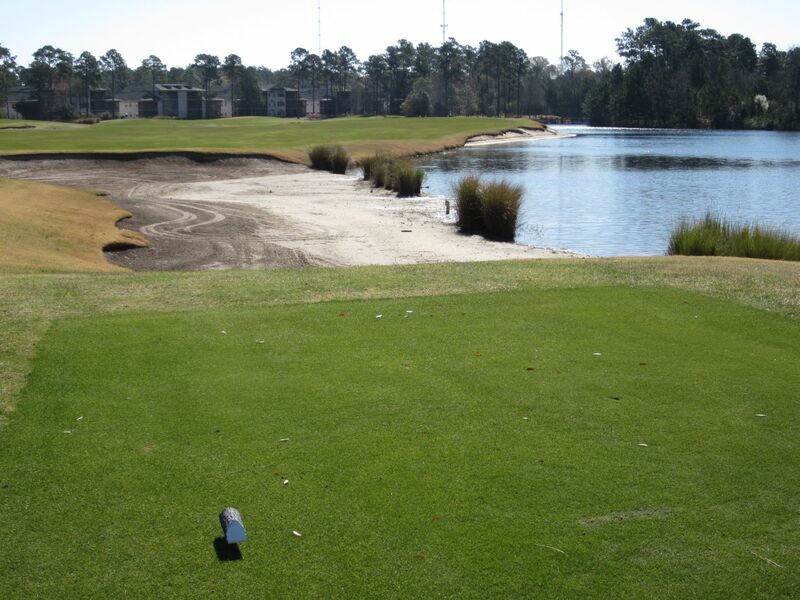 With sand running down the entire left side of the hole, the right side is lined by trees and more sand-filled wasteland. 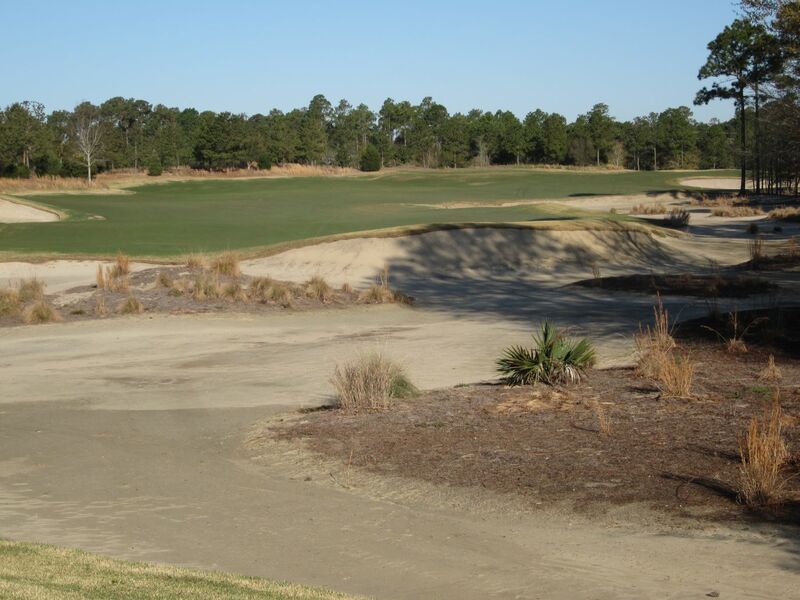 A creek runs in front of the green, which is elevated and surrounded entirely by more sand. 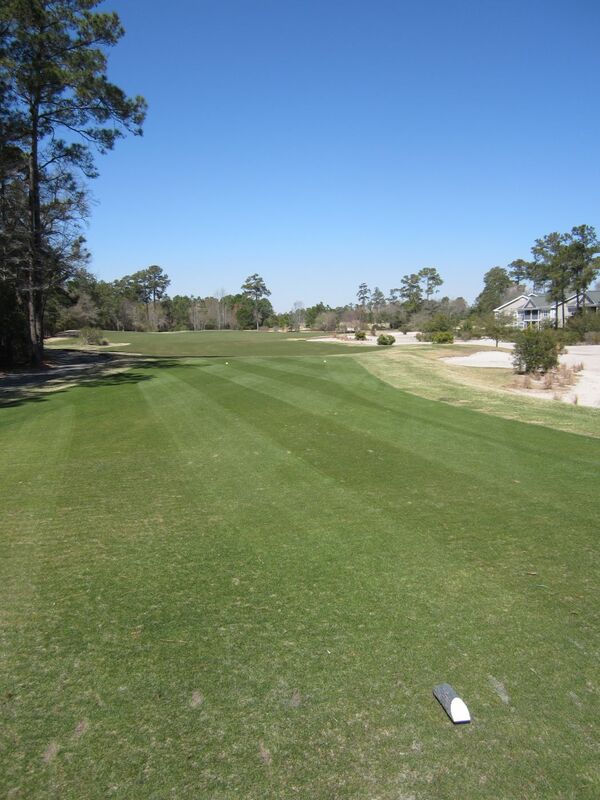 Make sure to leave the green to the left side to make a shorter trip to the second hole. Both times I played here, we went to the right and added several hundred feet to our trek. The second hole might as well be a beach. Use a long iron to find the fairway to give yourself a chance to hit this sliver of a green, located amongst trees and deep bunkers. Anything off the fairway will leave hell to pay, including a huge tree right that will block your approach almost entirely. The third hole is one of the most beautiful par threes I have ever played. Featured in the Dustin Johnson commercial mentioned earlier, the green is massive, but there is a huge carry that is destined to put a little doubt in your mind. I hit the front side and rolled in to the sand that leads to the water. I luckily stayed out of the hazard, but had a huge uphill shot to get out. 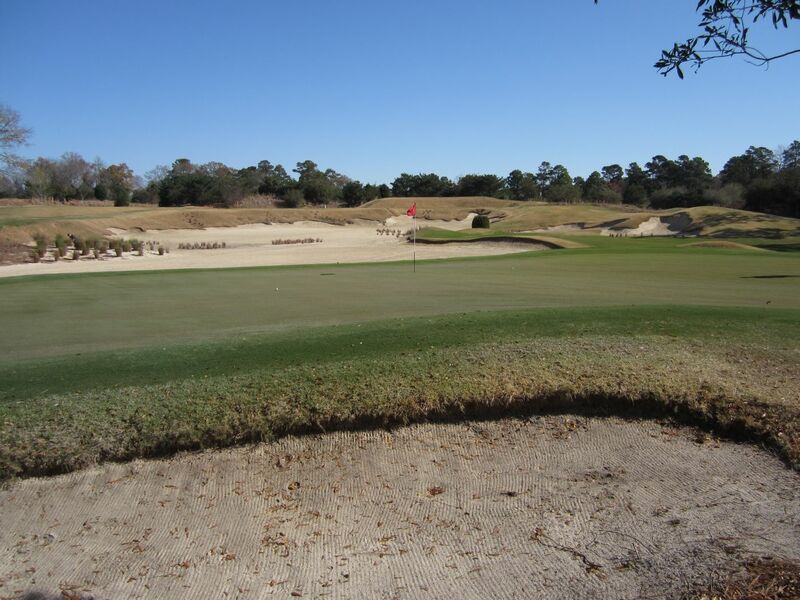 A similar bunker surrounds the entire green, so holding the putting surface is crucial. The fourth is one of the most beautiful, and challenging, par fives I have found anywhere. With a tight fairway that does a semi-circle around a huge pond, the most important shot here is the second. 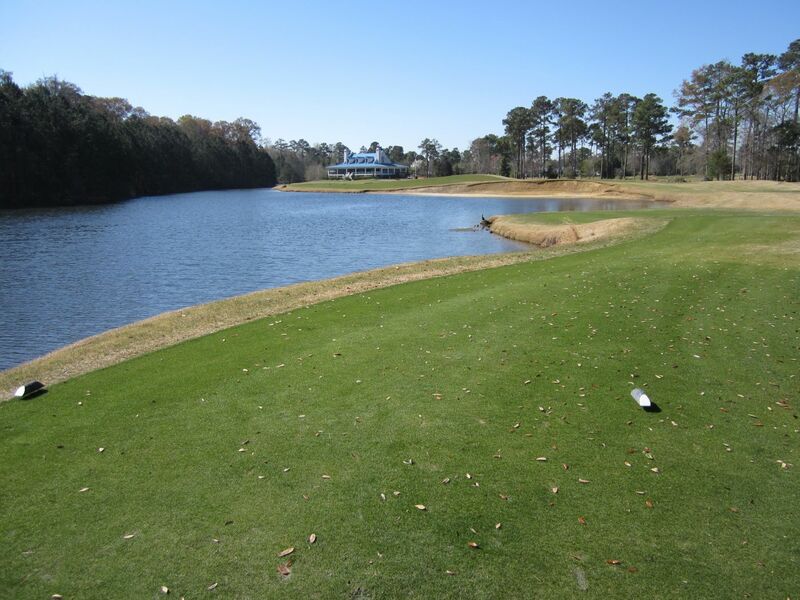 It is well over 200 yards to carry the middle of the pond from the fairway, so you’ll need to find a target area that will afford you a more comfortable distance to the next fairway position. The right side of the approach area filters on, while left of the green leads back to the pond. I would love to have one of the condos on this hole to get a birds-eye view of how other players tackle the challenge. The fifth is playable, if you can find the heart of the fairway. A large green is reachable, and this hole is almost a breath of fresh air in the heart of an otherwise unbelievably difficult stretch of holes. 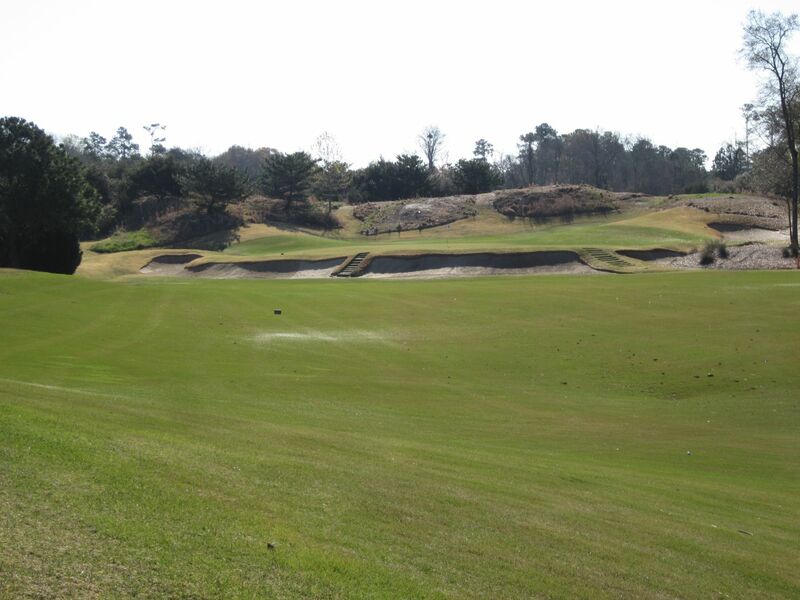 The sixth is an interesting hole that features a carry of 180 yards over wasteland, and two greens. We played the green to the right, which I was thankful for. 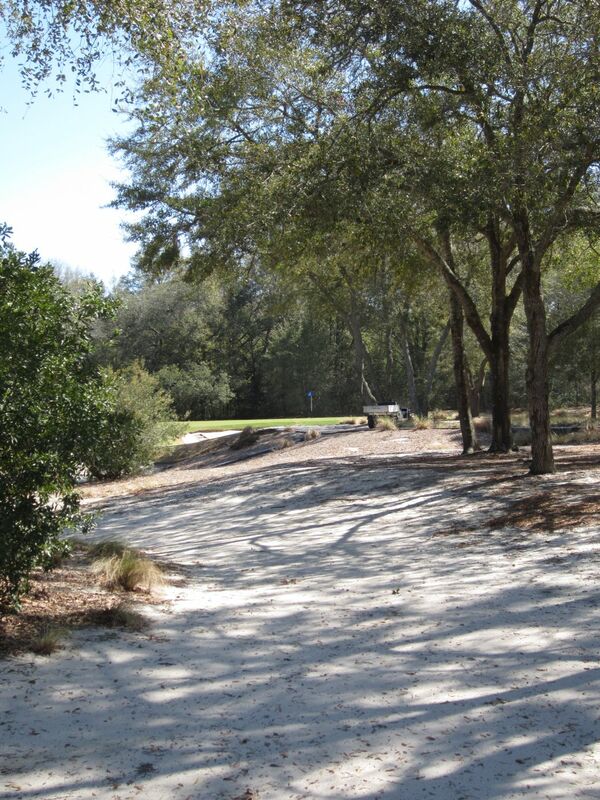 The seventh is the second par three on the front nine, and plays over a 150 yard long sand trap on the right. The green is huge, but has a massive break half-way through it that separates the left and right sides by a considerable height. 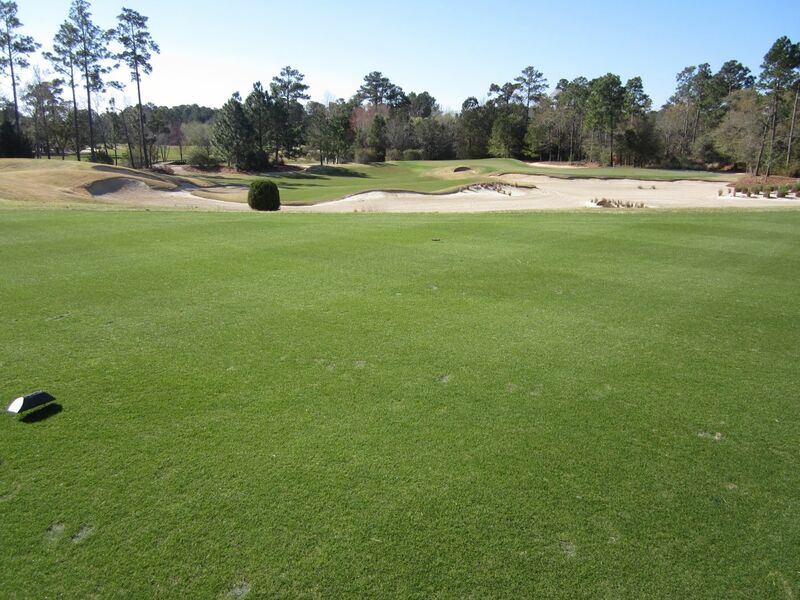 The distinguishing feature on the eighth hole is the green complex. Well elevated, the false front on the right side needs to be considered. Both times I played this hole the pin was front-right, and both times I hit the front, only to have my ball roll back down the hill at least ten yards. The tee shot on nine plays strongly from left to right, playing nicely for a fade. Get as far right on the fairway as you can for any chance to fly the greenside bunkers. Ten is another big par five. 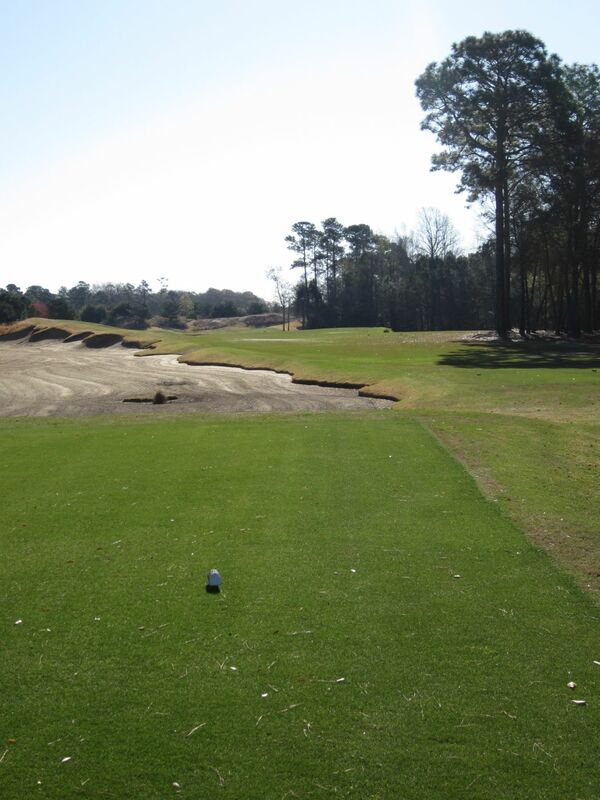 At 559 yards from the white tees, the fairway is split by an alley of sand a little over 300 yards out. 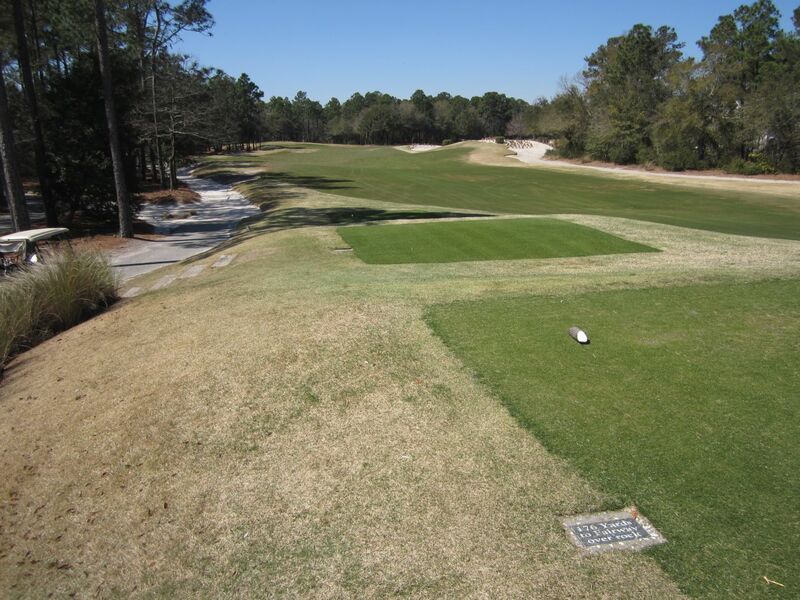 The tees are elevated, and the landing surface is charitably wide. Missing it will result in a long shot off the beach, which covers the right side of the fairway. 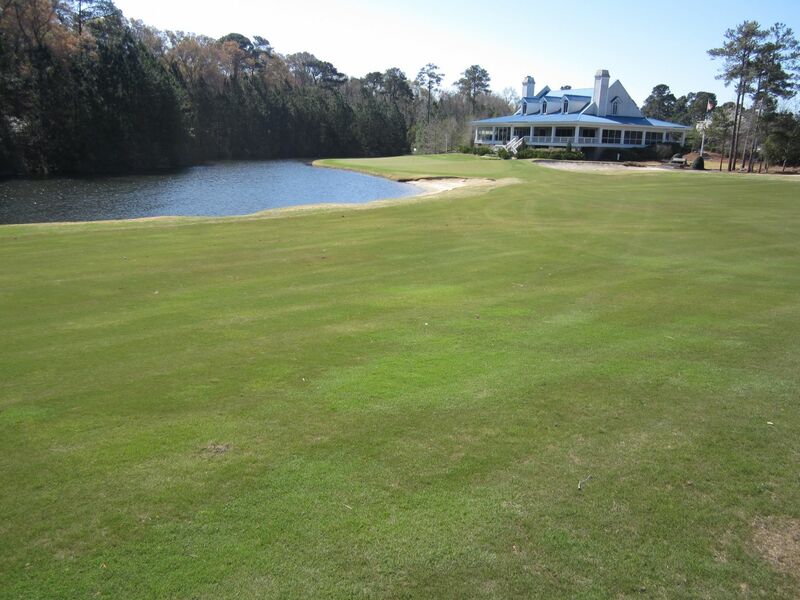 Deep grasses and a large sand trap that front the green should add an extra club for the approach. If you thought there was a lot of sand on ten, wait until you see eleven. 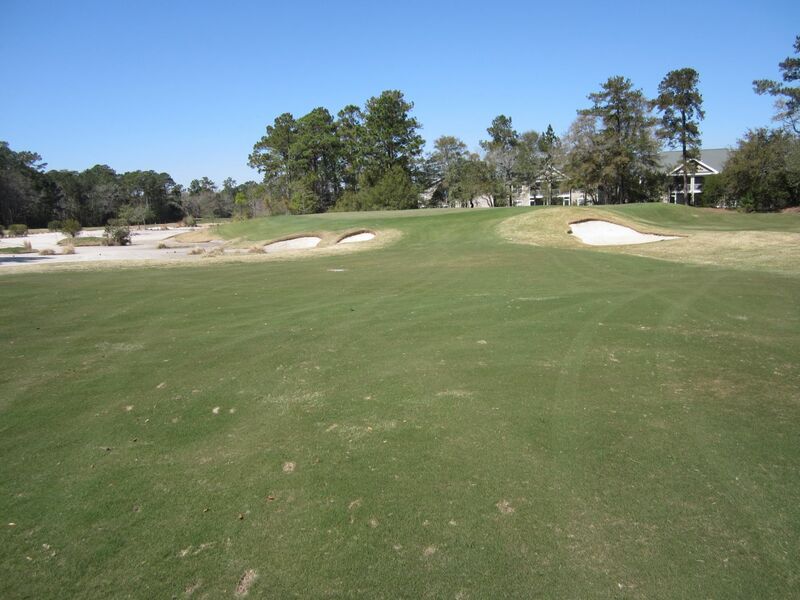 The entire hole layout, minus the green and a small amount of fairway short and left, is a tumultuous sandy wasteland that runs from the tees to the back of the green. The green is fairly narrow. Although a manageable 130 yards from the white tees, this manages to be one of the toughest par threes on the course. Twelve has something fairly rare for True Blue: Rough. With trees left of the teeing area, a straight tee shot or draw is almost necessary – my fade caught the trees and left me in more sand. 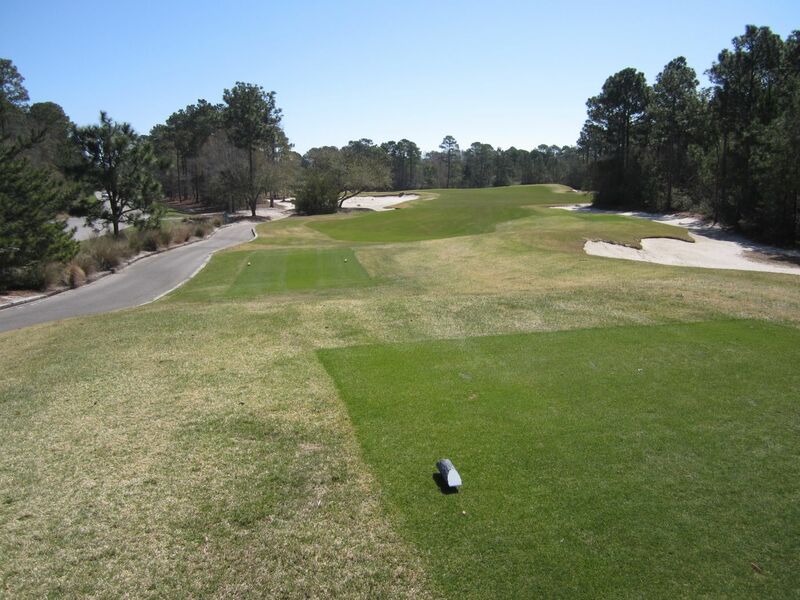 The fairway plays right to an elevated green that is protected by deep bunkers. 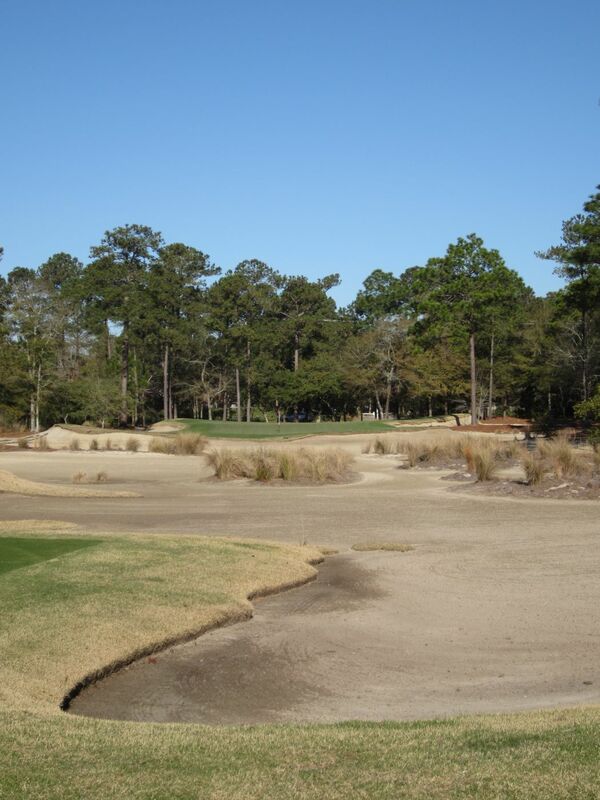 High birms shroud a deep aisle of sand that runs the left side of the fairway area on thirteen. The right side is heavily forested, so the only safe place to drive is dead nuts down the middle. 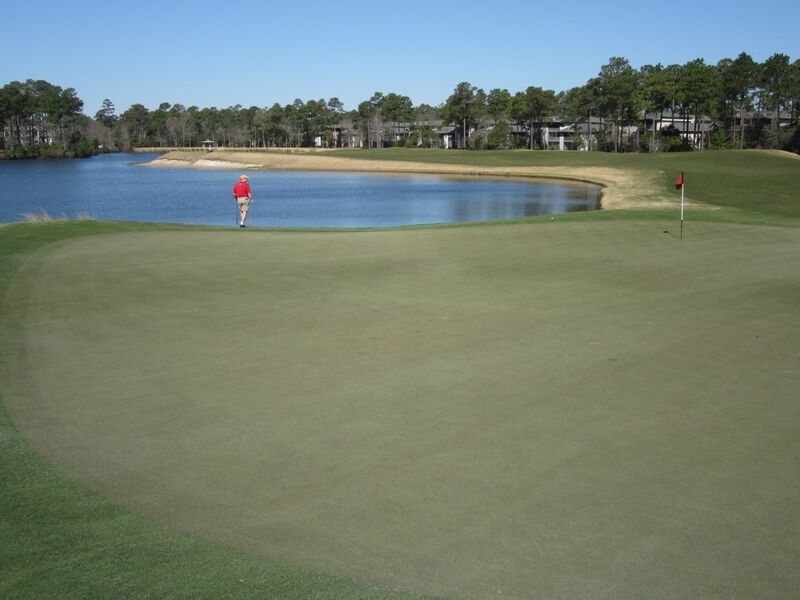 The heart of the landing area is wide, and a semi-circle sand trap runs from the left to the right, encircling half of the green. 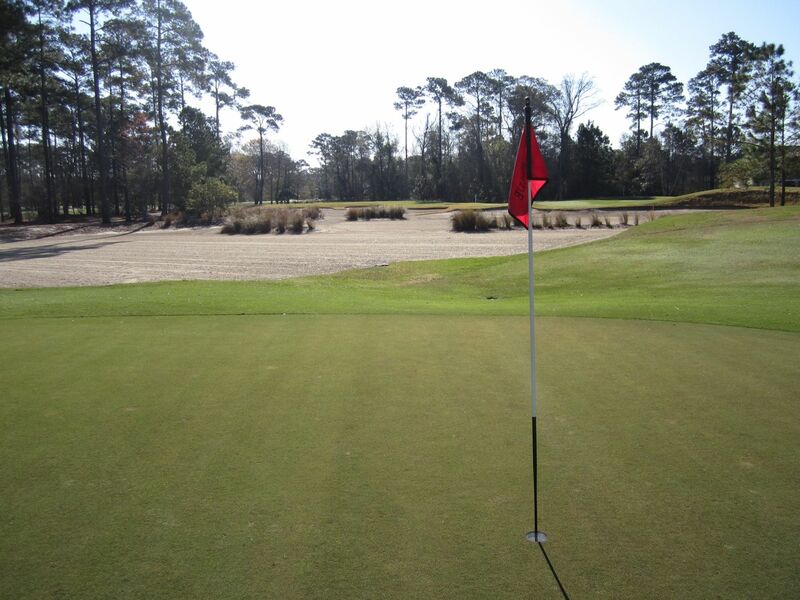 Fourteen is another wonderful par three, with one of the longest, narrowest greens on the course. The left side is about five feet above the right, and at least 100 feet away laterally. We each brought one ball up to this plateau for a putt-off of cataclysmic proportions – no one was able to keep the ball within ten feet. 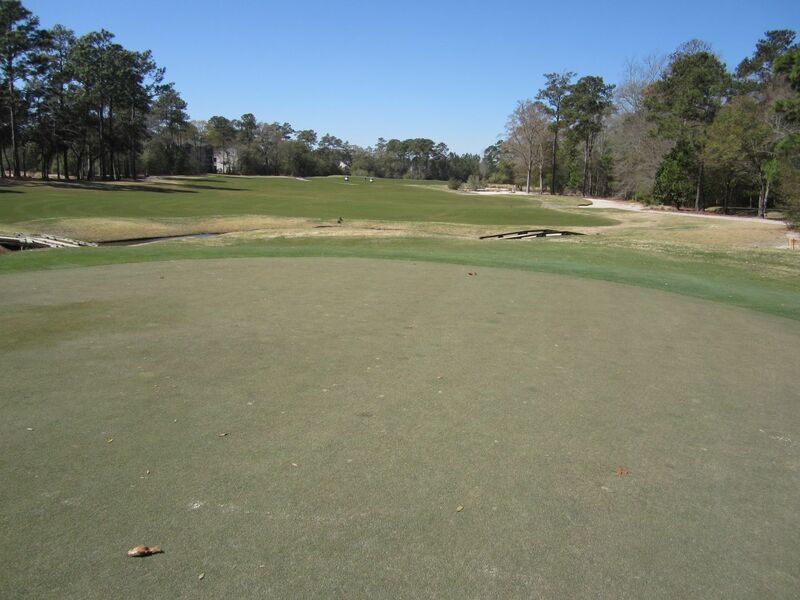 While the green is unbelievably long from left to right, it is very shallow from front to back. 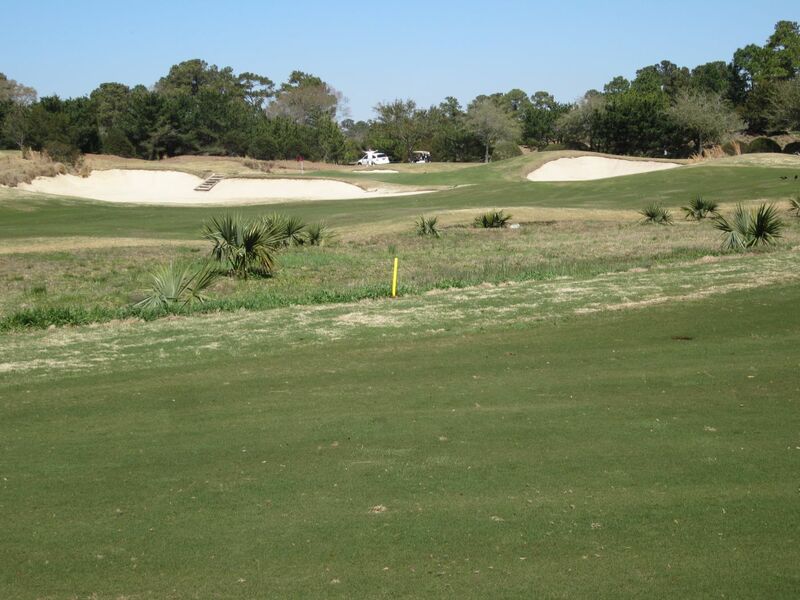 The fifteenth hole has one of the most generous fairways on the golf course, along with tons of sand. At 577 yards from the white tees, this is a typical feeling par five for True Blue. Bite off as much distance as possible on the tee and setup shots, because the green is far from simple. Well raised, the green features a slight false front and trees beyond. What can I say about sixteen? This is another typical par three at True Blue: Tons of water, tons of sand and a huge green that slopes all over the place. 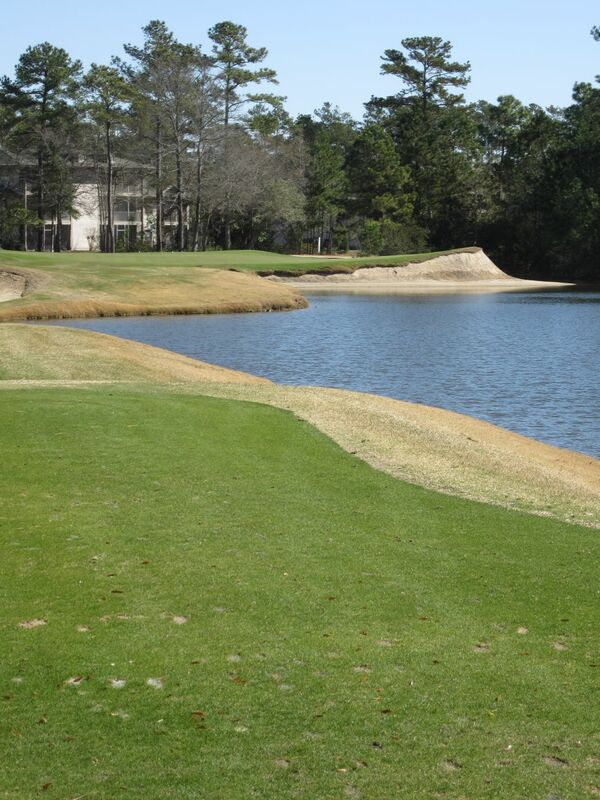 I love the way the sand on these par threes runs in to the water. Keep an eye out for gators if you find yourself in them. 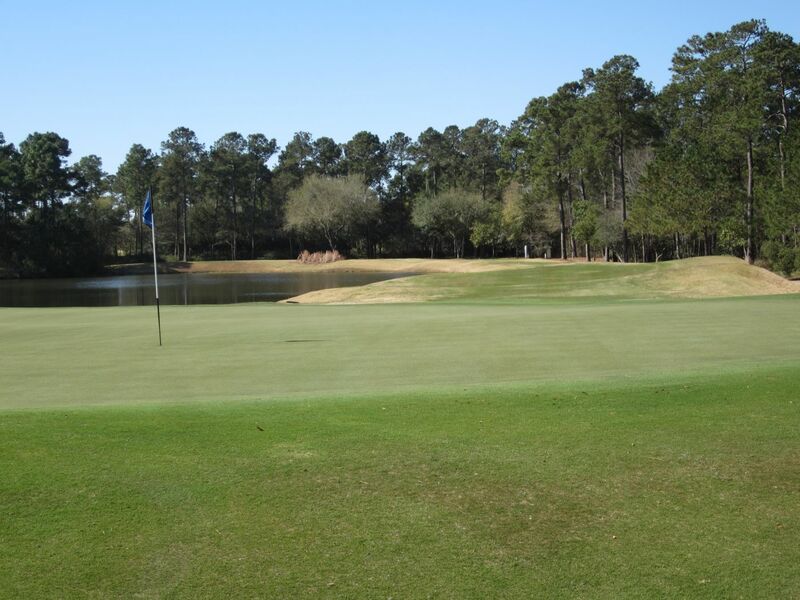 Sixteen is the longest of the par threes at True Blue, at 181 yards from the white tees. Seventeen is my favorite par four at True Blue. 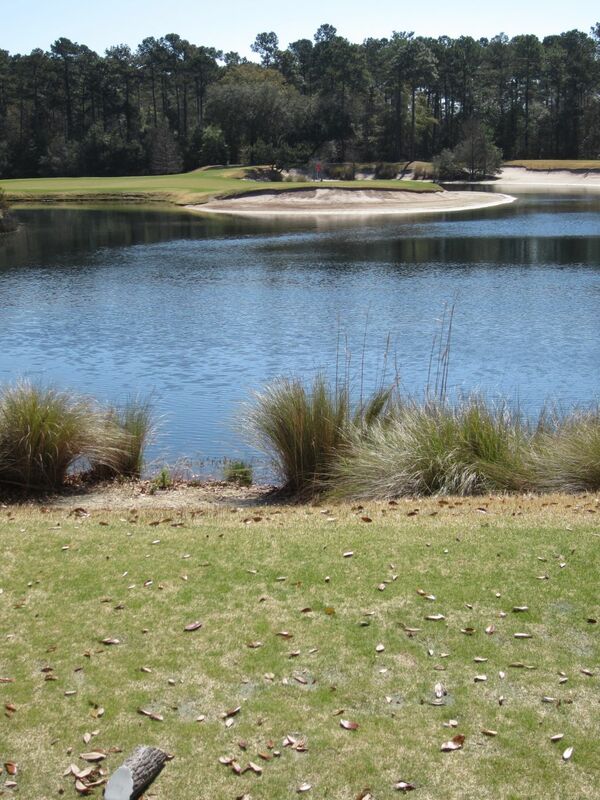 A huge pond resides on the right side of the fairway, and runs all the way to the green. The driving area is wide, but the approach area is anything but. Take an extra club to keep dry. I love finishing holes that play to the clubhouse, and True Blue has a fantastic one. 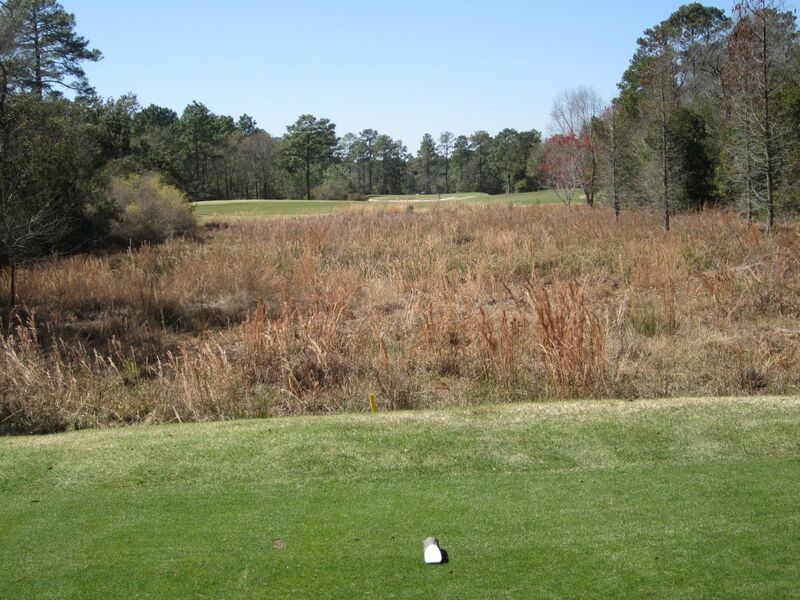 Like on seventeen, the fairway is hittable, and the drive will determine how long and challenging the approach will be. 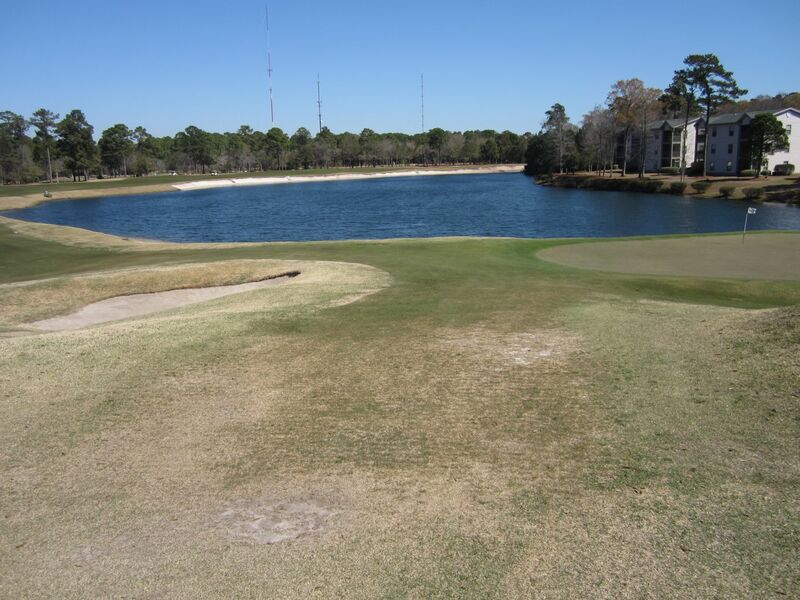 The sand trap on the back side of the green is deep and plays out to a pond that fronts the green, making it an unenviable location to play from. The green stretches to the edge of the water, and it was a blast watching other players’ approaches to this green while enjoying lunch after our round. 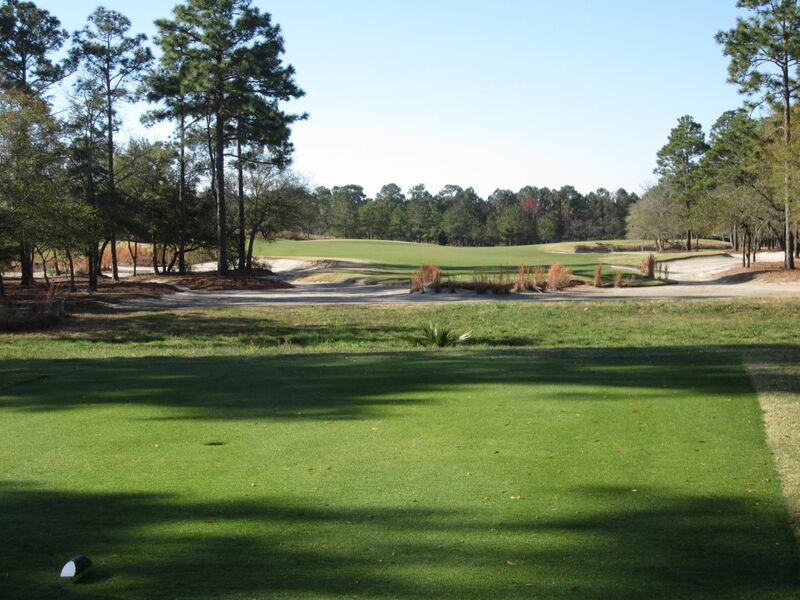 While I am nowhere near ready for this golf season to end, I am certainly looking forward to next March’s annual trip to South Carolina. True Blue is already on the itinerary.